ARLEY - Members of the Arley Women’s Club, Meek school principals and educators from Camp McDowell Environmental Center held planning meetings recently to further the club’s recycling program. They identified steps necessary to introduce and implement the new program at Meek Elementary and Meek High School for January 2019, as a result of a $3,000 grant the Women’ Club received from NW AL Resource Conservation and Development Council (NWAL RC&D). Phase I of the Program was initiated in June by the Arley Women’s Club (AWC). It began with the concept of recycling offered to a control group of members and several municipal offices. A dedicated team of AWC members have staffed the large container, helping visitors’ unload recyclables, rain or shine, and loading into a large container. Cooperation from the town was crucial, as Mayor Chris Tyree and the town council provided an underutilized fenced-in location for the collection site. After successfully collecting twice a month the group has collected seven tons of recyclables – in the form of plastics, paper, aluminum cans and cardboard. It is hauled away each month to a JCR recycling plant in Cullman. Participants say they are reducing their garbage by 25 to 50 percent! A matching grant was provided by AWC, after the initial seed money had been donated by a couple of civic minded ladies in the community to get the initial containers rented. The next phase is underway as a result of these two grants. Phase II of the recycling program is all about education. Starting in the schools teaching students about the importance of recycling and protecting the environment, learning not to litter, the excess trash cycle can end. Money will be saved by the schools on waste disposal which is also beneficial to the community. It is expected to eventually benefit local residents and taxpayers as their costs for garbage removal will be reduced when they can recycle. Specifics of the Phase II educational grant will include a classroom science curriculum which will be developed by Camp McDowell Environmental Center educators under the motto “Meek Goes Green.” One program will be developed for Meek High School and another will be created for the Meek Elementary students. A kick-off event will take place in both schools, explaining what things they can expect to learn about and how it will benefit students, their school and community. Educators will bring to each classroom a hands-on workshop, and reach every student during a four-week period from Monday, Jan. 14, through Monday, Feb. 4. On Feb. 5, Environmental Educator Steve Trash will be wrapping up the educational series with his award-winning Trash and Recycle Show. Steve Trash has been awarded the Environmental Educator of the Year Winner by EEAA and is a lifetime member of the Alabama Association for Environmental Education. His show won the statewide Outstanding Project Award presented by RC&D in 2007, and his “Kids Making Better Choices” video (which he wrote, produced and starred in) won the award in 2009. To further encourage and reinforce the educational program, recycle bins will be placed in each classroom, offices, library, teachers’ work rooms and even kitchen areas. A large container secured from JCR Recycling of Cullman will be placed on the campus exclusively for school use–only Meek school officials will have access to the recycling container. Students will be allowed to bring a backpack full of recyclables from home, thereby encouraging their families to participate. Students will each be given their own “Meek Goes Green” backpacks. Four environmental educators from Camp McDowell will be involved in the creation and instruction of the new curriculums. Seth Justman, an Environmental Educator with the camp is ready to fine tune a curriculum. Meek High School principal, Marla Murrah has also set a goal – to reduce garbage generated from the school to by 50 percent - to not only help the environment, but also to help reduce the costs of garbage collection. “We feel it is very important to educate our students on environmental matters, and we are very thankful to partner with the Arley Women’s Club and appreciate the support our superintendent has expressed as well,” Murrah stated. Winston Board of Education Superintendent, Mr. Greg Pendley agrees. 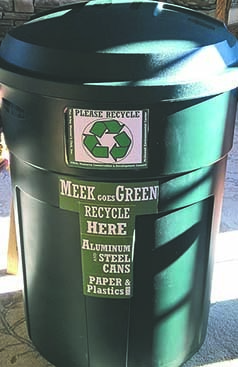 "All entities involved are to be commended on the recycling initiative at Meek Schools. Mrs. Murrah and Mrs. Tucker, along with their staff, are helping the students at Meek understand how every person has a responsibility to take care of the environment and they can make a difference."